Wikipedia's love of listing obscure things in an unbelievably earnest way provided the content for this map, showing an assortment of people who claimed to be either the Mahdi, the Jewish Messiah or the Second Coming of Christ over the last few millennia. It's obviously a slightly arbitrary list, with Messiahs getting the best coverage, and Christian pretenders strangely absent between the 1st and 19th centuries. Still, there's a nice geography to where these people appear (you have to move the map a bit to see North America, but you'll certainly find a lot there), and a lot of them have a great esoteric, Borgesian quality too. Also, I like the fact Wikipedia lists Jesus at the top of the list of Jewish Messiah Claimants, but not on their list of People Who Have Claimed to be Jesus. 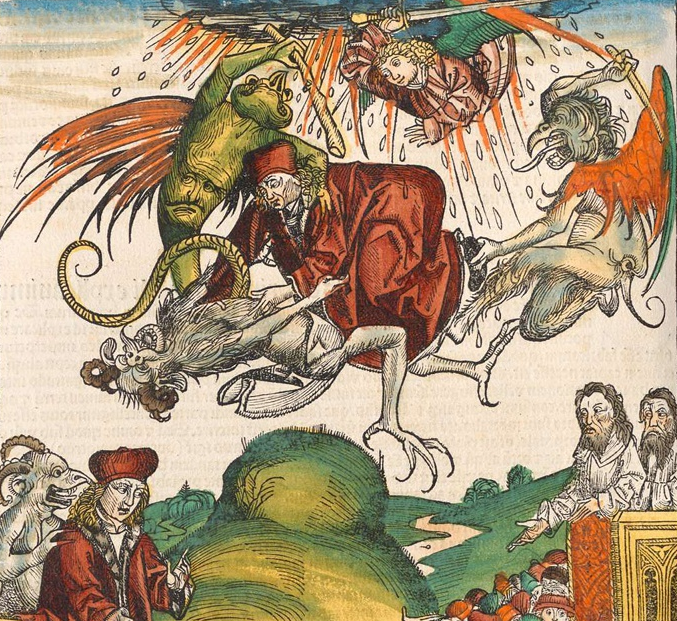 The image at left is from a German work called the Death of Simon Magus. Simon Magus, or Simon the Magician was an early gnostic who not only appears in the Acts of the Apostles but also in today's map.